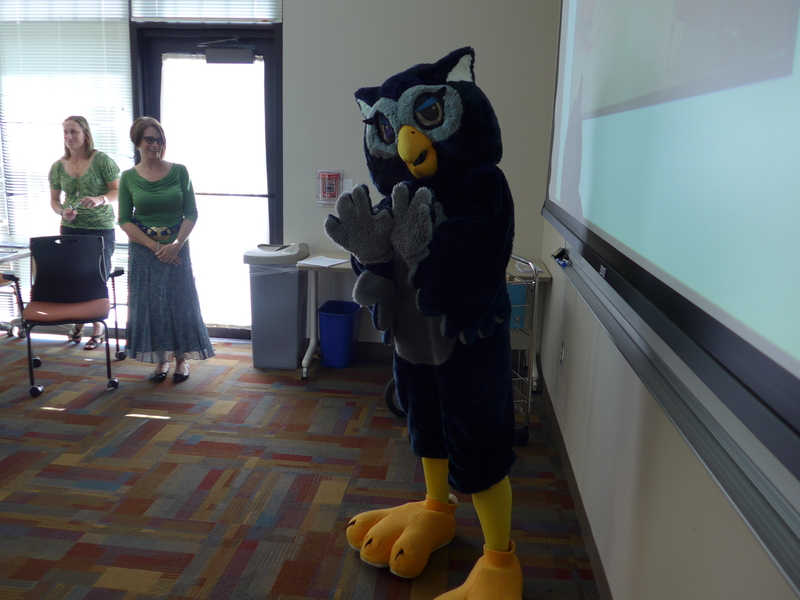 Karen Rogers, ’68 and I gave a talk today about the history of Sammy. There’s a lot of material about Sammy spread across all kinds of collections and this was the first time we’d ever tried to pull even a little bit of it together. It all turned out to be pretty interesting, with lots of twists and turns, drama, tragic demises, a surprisingly large number of kidnappings and not a few loose ends and unanswered questions. One of the astute listeners at the talk suggested that it may have been homecoming and that the mysterious box in the first image could be a case of beer. Closer inspection reveals that to be exactly the case. But why the barefoot fellow dressed like a pregnant woman? Could be the Arkansas game, I suppose. Bonus: Sammy actually showed up in person! I confess I enjoyed seeing everyone in the room line up to get their picture taken with him. I would love to see that talk. I’m fascinated by the change in the character between 1970 and 2014. That’s a very different looking Sammy! No, I’m afraid not. I’ll be happy to post a bunch of the images though, and I bet we can get Karen to let me use some of the ones she found as well. Is that a dog biscuit on the ground a few feet in front and slightly to the right of the “pregnant woman”? We really need to get Grungy to chime in. 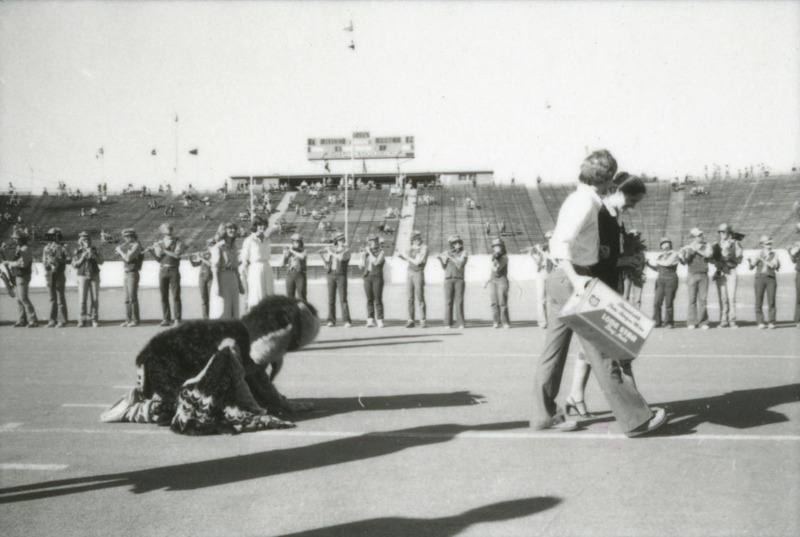 I believe this is the 25th anniversary of the 1972 A&M game where they brought out the refugees who had been hiding for 25 years. In c. 1986, the Rally Club raised money for a new Sammy costume, the replace the old one which was hot, disgusting and disintegrating. We raised the money in a remarkably short time. Looks like Norman Hackerman in the first photo. Doesn’t that make it 1971 (or later)? It does look like Rice’s opponent is “ARK” (on the right-side of the scoreboard), which has a halftime score of 14. The only game in Houston between 191 and 1981 with an Arkansas halftime score of 14 was on November 3, 1979: The Hogs led 14-7 (See p. 12 – https://scholarship.rice.edu/bitstream/handle/1911/67326/thr19791108.pdf?sequence=1 .) enroute to a 34-7 blowout. The photo shows a vertical line in the middle of the Rice score box, which could be consistent with a “7”. Unfortunately, the online MOB script archive (http://mob.rice.edu/history/scripts/) does not include that game’s script. This was 1979 or 1980, and Norman Hackerman was, in fact, president. The Homecoming Queen, seen walking with the guy carrying the mystery box, was Nicole Van Den Heuvel (my roommate, and current head of Career Services at Rice). 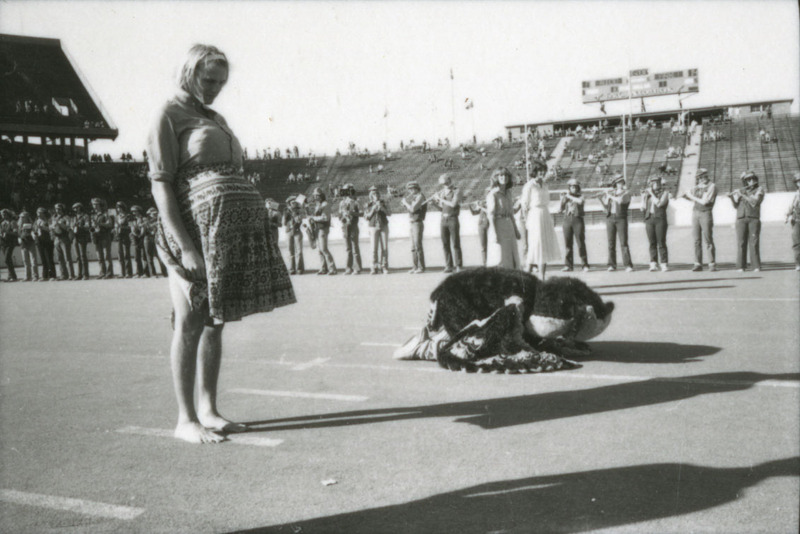 The “pregnant woman” was Bob Schmidt (Will Rice, I believe), and I believe he was the Homecoming King. I don’t recall his costume having anything at all to do with Arkansas…. 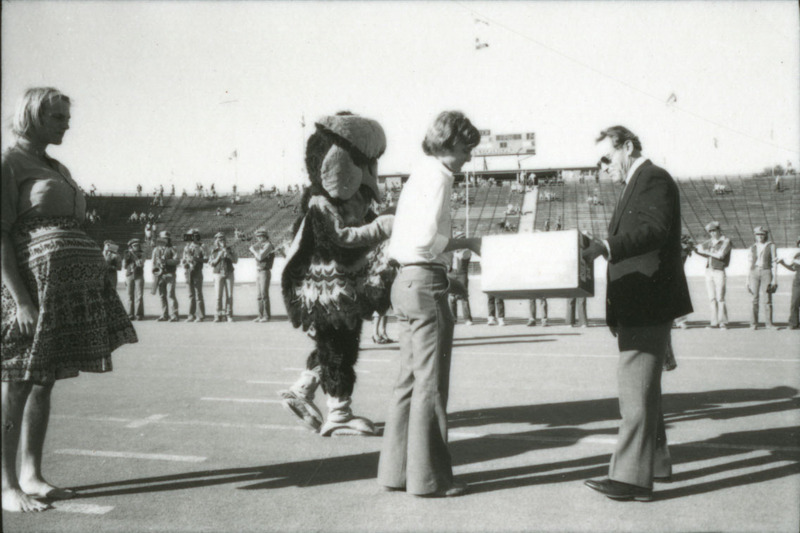 During the late 80s and early 90s, a group of Rice students lived next door on West Main, and one of them was Sammy the Owl. On game day we would see him dressed in the suit and he would occasionally interact with my daughters. When we would then go to the game, my daughter Zoe would often tell complete strangers that Sammy lived next door to her. I recognize several of the MOBsters, and the blonde woman in the dress, behind Sammy, appears to be Marian Schauerte. Going to try to get the telecine to function or another 16mm projector, and watch the film of the show. The case of Lone Star was the traditional gift for the Homecoming King. The Homecoming Queen received a dozen red roses. Hasn’t Marshal-the-Creature appeared in this blog at one point or another? Given that they are Rice students, it is not likely the task will be done soon.